The Broken O Ranch was named by The Land Report as the 2012 Deal of the Year. Click on the Land Report link to read more about it. The Broken O Ranch is one of the Rocky Mountain West’s most grand and significant ranches. 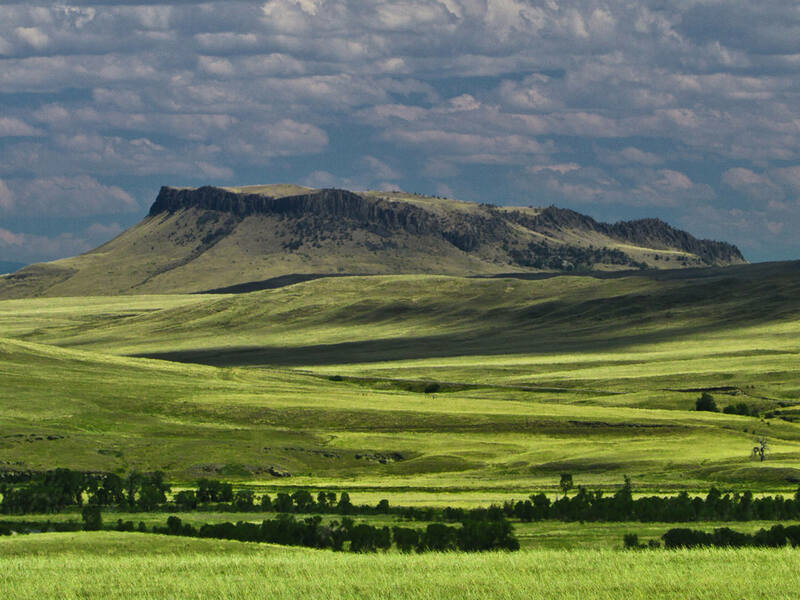 Encompassing almost 124,000 acres of deeded and leased land, the Broken O Ranch is located 45 miles west of Great Falls, Montana and east of the stunning Rocky Mountain Front. 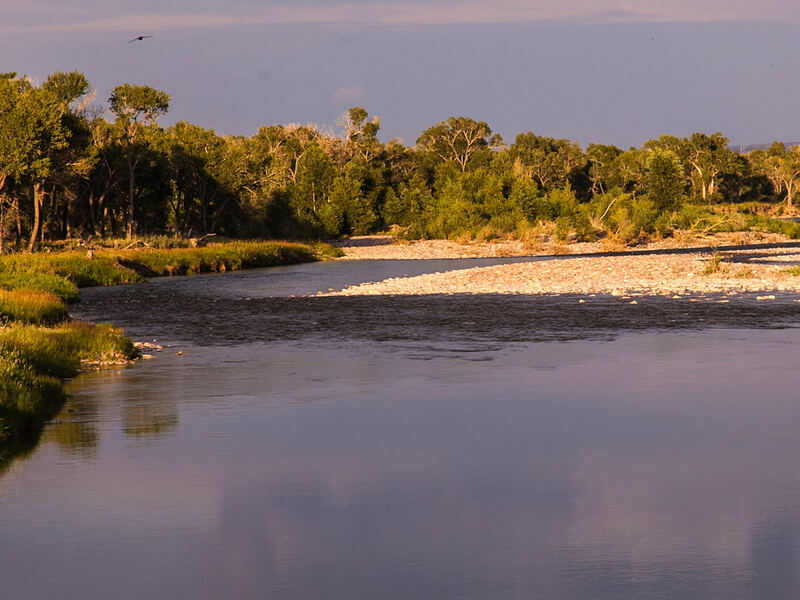 Over 20 miles of the beautiful Sun River flow through the heart of the Ranch, offering prime irrigation benefits as well as amazing hunting and fishing assets. Under the vision of William E. and Desiree B. Moore, founders of the Kelly-Moore Paint Company, twenty years were spent assembling this massive land holding. Spread across Lewis & Clark, Cascade and Teton Counties, the Ranch was carefully shaped and improved by the Moores to create this productive enterprise. 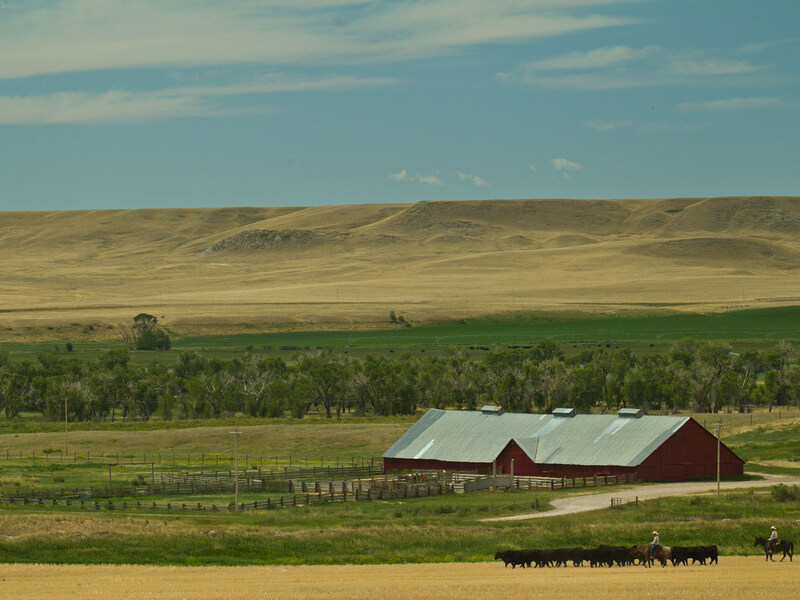 This expansive and versatile Montana cattle ranch for sale is well-positioned to capitalize on the growing global demand for beef and grains. The Broken O Ranch currently carries 3,500 mother cows plus 800 replacement heifers and 175 range bulls. This Montana ranch for sale includes the state’s largest block of irrigated land – 13,000 acres – historically produces about 25,000 tons of alfalfa hay and 700,000 bushels of small grain crops annually. The Cattle Division and Headquarters of the Broken O Ranch are located 10 miles east of Augusta and about 11 miles west of Simms on State Highway 21. The Farming Division is located approximately two miles west of the Cattle Division via State Highway 21. 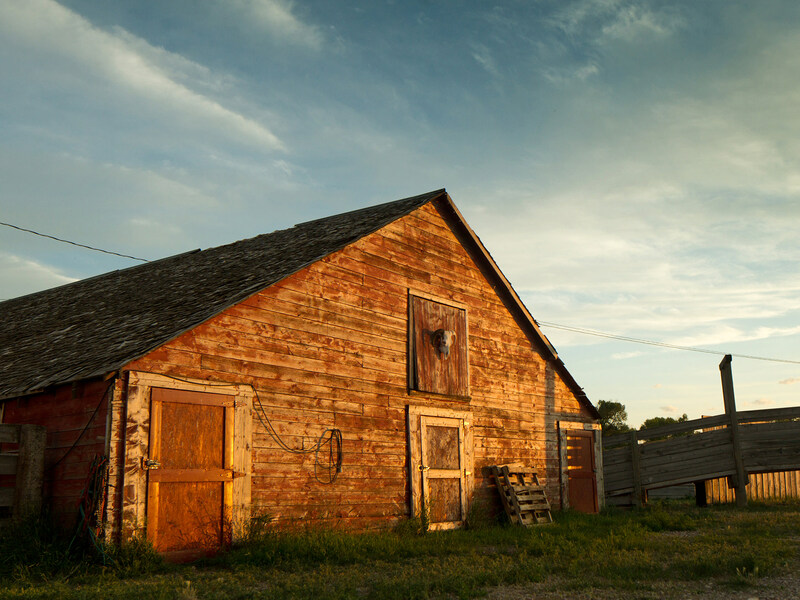 Great Falls, the third largest city in Montana, is a comfortable 45-minute drive from the Ranch. Besides the Broken O’s tremendous agricultural production, it offers outstanding recreational amenities. The Sun River corridor provides exceptional brown and rainbow trout fishing, antelope, whitetail and mule deer hunting, as well as extensive upland game bird and waterfowl populations. “The Broken O Ranch is one of the Rocky Mountain West’s most significant holdings to come on the Western real estate market in decades. The scale, commodity production, recreational amenities and overall diversity make it one of the most unique offerings we have ever represented,” according to Managing Broker Mike Swan of Bates Sanders Swan Land Company in Bozeman, Montana. With its unique combination of productivity, scale and grandeur, Montana ranches for sale such as the Broken O Ranch present a rare opportunity for land stewards and investors. According to the Fall 2011 issue of The Land Report, the next owner of the Broken O Ranch would take an immediate position as the 89th largest land owner in the United States – an iconic designation within the Nation’s esteemed fraternity of landowners. The Broken O Ranch is being offered turn-key including all livestock, hay and grain inventories at the time of sale, plus machinery and equipment. An extensive internal road system has been developed utilizing gravel from the Ranch creating year-round access to most areas. A number of cattle guards set in concrete foundations have been installed throughout the Ranch for further ease of access. The utilization of double steel gates at key locations provides for easy movement of large farming implements. Driving from Great Falls to the Ranch, take Interstate 15 north to State Highway 200 at Vaughn. Follow Highway 200 west to Simms where the highway divides and bear west on State Highway 21 towards Augusta. Between mile markers 10 and 11, the Broken O Ranch Cattle Division sign, readily visible on the north side of the highway, identifies the road which leads to the Ranch Headquarters. Known in Montana as the “ElectricCity,” Great Falls is the commercial and banking hub of north central Montana. With a population of approximately 60,000, Great Falls offers a complete and diverse array of retail, dining, supply and equipment services. The Great Falls Clinic Medical Center also provides quality health care and surgical services. Malmstrom Air Force Base, located just east of Great Falls, is home to the341st Missile Wing, one of three U.S. Air Force Bases that maintain and operate the Minuteman III intercontinental ballistic missile. Convenient commercial air service is provided at Great FallsInternationalAirport with good connections offered by Delta, Horizon, Northwest, Allegiant Air and Continental Airlines. Currently, direct flights are available to Denver, Las Vegas, Minneapolis, Phoenix, Salt Lake City and Seattle. For up-to-date flight schedules and airport information, please refer to the airport website: http://www.gtfairport.com/. Augusta offers limited services which include a gas station, convenience store, post office and café – a classic Montana ranching town. Choteau, the TetonCounty seat, sits about 20 minutes to the north and provides a larger range of services. A well-maintained public airstrip is situated on the northeast edge of Choteau. Located at an elevation of 3,942’, the 75' x 5,000′ asphalt runway is in good condition. Communications for this facility are available through Salt Lake City at Frequency 133.4/285.4 (Great Falls RCAG). Families can expect their children to receive a high-quality kindergarten through high school education at AugustaPublic Schools. Students attend from the surrounding community to experience the unique environment of the small-sized multi-grade classrooms. The high school is classified as a Class C school (under 160 students) by the Montana High School Association and provides a great learning environment and competitive interscholastic athletic programs. School bus service provides round trip transportation for elementary and high school students in the area. The Augusta community has traditionally been very supportive of the school system and has historically supported school bonds for capital improvements and upgrades. With the Ranch typically employing as many as 25 families, it has a significant impact on the local economy and the local school system. The local area is primarily comprised of small- to mid-sized cattle and farming operations. Further upstream on the Sun River, land ownership is comprised of recreational and hunting landowners with scattered agricultural operations. Situated about twenty-five miles west of the Ranch are several of the most noted land forms of the Rocky Mountain Front – Castle Reef, Sawtooth Mountain and the stunning Sun River Canyon. This majestic panorama of rugged limestone peaks, sheer walls, towering reefs and deeply-cut canyons provides a viewscape like nothing else in North America. The topography of the Broken O Ranch can generally be described as a Great Plains setting with strong water influences throughout. The Sun River is a significant geographical attraction as it flows from west to east through the center of the Main Ranch Unit. Much of the Ranch contains hills and valleys providing a diverse landscape. The Broken O Ranch encompasses approximately 108,571 deeded acres plus an additional 15,270 acres of State leased land and 160 acres of Bureau of Land Management (BLM) lease land. The irrigated acreage is part of existing change applications which have been submitted to the Department of Natural Resources and Conservation by the Seller. The Ranch is divided into two units, the Main Ranch Unit and the Harris Unit. The Harris Unit lies about one mile due north of the Main Ranch Unit boundary. This Unit is a summer grazing pasture consisting of native range with the following approximate acreages. These acreages and AUMs are included in, not in addition to, the above calculations. The Harris Unit is watered from Roundup Coulee and from several springs which serve stock ponds. There are two stock wells on the Harris Unit which can serve several stock tanks and are for backup purposes only. It is utilized as one pasture for spring and summer grazing of heifer pairs. Half of the approximately 3,000 acres of dryland crop ground is farmed annually with the remaining acreage summer fallowed, alternating each year. These fields are normally planted in either spring wheat or barley. The approximately 1,500 acres of dryland crop ground located on the western portion of the Ranch has historically yielded 50-bushel winter wheat or 35- to 40- bushel spring wheat. The remaining dryland crop acreage is located north of the Sun River on the west end of the Ranch and averages closer to 25- to 30- bushel yields of spring wheat. These fields are chem fallowed with the planted fields being fertilized. The irrigated crop land and the dryland are on a three year soil testing rotation system. This provides up-to-date information to the Agronomist and the Ranch Manager for annual crop planning, while taking into consideration fertilizer and fuel costs and the hay and grain markets. During this process the annual farm plan is developed for the upcoming spring. The native range pasture land is predominantly comprised of slender wheat grass, blue grama, June grass and various fescues. Western wheat grass is abundant in the majority of the higher elevation ranges. Much of the 6,000 acres of improved pasture consist of crested wheat grass for late spring and early summer grazing south of the highway. The steer pairs are put into these pastures in early spring to utilize the high protein hard grasses to maximize weight gain. At this time, the bulls are brought into the pasture with the mother cows to begin the breeding cycle. Several large improved pastures south of the highway contain pubescent wheat grass which greens up in late June to early July and remains so for much of the summer. The heifers will graze on brome and fescues of the sub-irrigated pastures until they are moved to the hard high protein grasses, predominately comprised of western wheat grass and sainfoin, of the Harris Unit from mid-June until October. The Ranch controls approximately 852 acres of land subject to the Conservation Reserve Program (CRP), in five federal contracts generating approximately $27,544.00 annually. These contracts expire in 2018 and the land subject to the contracts is currently leased to a neighboring rancher. An additional 50 acres of CRP ground is located in the Harris Unit, and the payment from this contract has annually been donated by the Seller to the State Land Trust Division of the State of Montana. The Ranch is not eligible to receive farm subsidy funds due to its total adjusted gross income exceeding federal and state limits. The Ranch ranks among the largest cow-calf operations in Montana, currently running about 3,500 mother cows plus about 175 bulls and about 800 replacement heifers. According to an assessment conducted on the Ranch in June 2011 by Norman C. Wheeler & Associates, the Ranch is currently rated at 5,200 Animal Units. As with any premier commercial cattle operation, bull selection is critical and the Ranch carefully evaluates their breeding stock on an annual basis. Replacement bulls are closely assessed based on their yearling Expected Progeny Difference (EPD). The purpose of EPD is to compare the genetic merit of the animal based on specific traits – such as birth weight, weaning weight, yearling weight, milking ability, carcass “cutability,” gestation length, scrotal circumference, and pelvic area. Ultimately the bull has to have good “eye appeal.” Bulls are typically kept for six breeding years. Years of discipline in the selection of breeding stock has produced a uniform high-index cattle herd. According to Dan Freeman, the Ranch Manager, the history of producing high-index calves on the Ranch at weaning has commanded a premium from mid-west feeders and packers. Broken O calves historically gain 3.25 to 3.75 pounds per day, finish fast, and grade very high. The annual steer crops command top dollar and have developed a reputation for quality over the past 20 years. First-calf heifers typically weigh around 1,100 pounds and begin calving in early February, finishing up in late March, and typically produce calves averaging 80 pounds at birth. These heifers are synchronized to calve within the first three weeks in February. They calve in the main calving facility located along the Sun River just east of the Cattle Division where they can be closely monitored. This expansive facility is heated and contains over 100 jugs to accommodate the heifer herd during the initial calving rush in early February. Once the calf is on the ground, the pair is kept in the barn for about a day before the pairs are sexed into one of two holding lots near the barn where they are held for three to four days to ensure the new calf has taken to its mother and both are healthy. By February 20th, any remaining un-calved heifers are split between the Freeman Barn and the New Barn Calving Facilities to be put in with the older cows as they begin the calving process. The average birth weights on the calves from the older cows typically run about 80 to 90 pounds. As the remaining heifers calve out, they are then trucked back to the Main Calving Barn to be sexed and put with the other first-calf heifers. The older cows have historically calved out in lots near each of the calving facilities. At birth, all calves are inoculated with Vitamin A and tagged. Once calving wraps up and the pairs are sexed, the steer pairs are turned out south of Highway 21 to the high-protein improved pastures and native grasses. They continually move to the east-southeast through the deeded and state lease lands until they end up at the Pick Hammer Unit located at the very south end of the Ranch to utilize the best hard grass for the most efficient gain. The heifer pairs graze the sub-irrigated pastures north of the Sun River and are moved from the pastures west to east and eventually to the Harris Unit. By mid-May the bulls are turned out with the cow herd to begin the breeding cycle. Calves are weaned in late October and given a preconditioning and an eight-way shot. The 2011 weaned steer calves averaged 682 pounds. In 2011 the heifer calves averaged 630 pounds. Steers are shipped immediately after weaning to commercial feedlots in Nebraska. The heifer calves are weaned directly from the Harris Unit and trucked to the Ranch feedlot. The replacement heifers will go through three separate culls until the final herd of heifers to be bred is established in late March. After weaning, cattle graze the dormant grass and alfalfa stands left from the summer. Most years, winter feeding of the cattle herd does not begin until late December or early January with first cutting alfalfa hay fed up to calving time, dependent upon weather. In this part of Montana, producers typically like to keep about 2.50 tons of hay per cow in the stack to get their cattle through the end of April. However, the Ranch historically feeds between 2.0 and 2.25 tons per cow. A 22% protein ration (SmartLic® supplements) is only used with first-calf heifers and three-year old cows through the Fall. However, the older cows are not put on a protein ration until after they calve. After calving, the cows are transitioned to second cutting hay rations providing a higher protein content to keep them healthy and nourish the nursing calves. After weaning, the ten-year old cows are sorted off from the herd and sold by private treaty. Each year the number of replacement heifers brought into the herd changes depending on dry-cull cows and sorting off the ten year-olds. Local ranchers actively seek to purchase any remaining bred heifers to bring the strong genetic lines of the Broken O into their herds. The Ranch currently runs about 1,100 head of their own replacement heifers which are culled down to between 700 and 800 head to be synchronized and artificially inseminated over two days in late April. Two to three heifer bulls (one bull per 35 heifers) are put in each of the heifer pens for a period of 20 days for cleaning up heifers on their second cycle that did not impregnate during the first cycle. By early June the heifers and bulls are turned out to grass. Heifer selection is a key component of continuing the high standards of the Broken O cattle herd. The native pastures are adequately watered with numerous stock tanks and reservoirs. A main water line which pulls water out of the Company Irrigation Ditch serves a series of stock tanks reaching from the highway to the south end of the Ranch. The pump is located near the intersection of the Dry Creek drainage and Highway 21 and runs due south for approximately seven miles. Supplemental water is provided through a series of springs and wells which serve stock ponds and water tanks along with several seasonal streams. Gasoline generators power the pumps which serve a number of water tanks located in the far south pastures. The generators are monitored on a daily basis. These pumps are used for back-up water only on dry years. The pastures located at the base of Crown Butte east of the Simms Highway (Montana Highway 200) are served by stock ponds and a well. 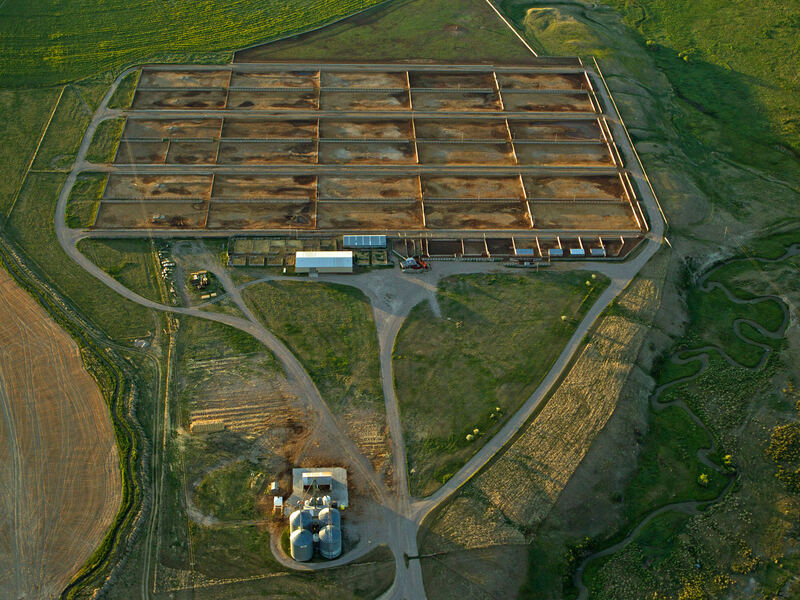 The 3,000- to 5,000-head commercial feedlot is licensed, permitted and in compliance with the Montana Department of Environmental Quality. During the Fall of 2011, about 3,600 head were fed in this facility. With 32 individual pens on individual waterers and concrete feed bunks, this feeding operation dwarfs many commercial feedlots. The Ranch contract feeds approximately 650 yearling bulls and about 1,500 replacement heifers on contract for several local purebred breeders in addition to Ranch heifers. Cattle are typically fed a 3:1 ration with 25 large alfalfa hay bales and seven to eight large straw bales per day combined with a percentage of barley, corn, wheat or oats – dependent upon the type of cattle in each pen. Also included in the ration are molasses and a mineral package including rumensin. The cost of running calves in the feedlot ranges from about $0.85 per day for a grass-fed spayed heifer to about $1.50 per day for a bull calf. On average, the replacement heifers cost about $1.00 per day to run in the feedlot. These expenses increase over the course of the winter and early spring as the animal gains weight. By March, this range will increase to approximately $1.10 per day for spayed heifers, bull calves costing about $1.95 per day and the heifer calves costing about $1.30 per day, depending on the hay and grain prices. The Ranch custom-feeds three different rations for each of the three classifications of cattle. A yardage fee of $0.35 per head per day is charged for contract cattle which covers labor, electrical, manure spreading and maintenance. The grain and hay is added to the yardage fee at whatever price the commodity is valued at that time. The feedlot has served as an additional revenue source by running hay and grain grown on the Ranch through contract confinement cattle. The only outside commodity purchased is corn for the bull calves which is contracted from South Dakota. Cattle are inspected daily by the Ranch Manager or Assistant Manager to ensure proper care and to identify sick animals. Two employees manage the feedlot on a full-time basis, overseeing the feeding, maintenance and overall management of the cattle. In 2011 there were six private verbal grazing agreements currently in place for the use of Ranch property. These leases have yet to be determined for 2012. These have historically been on a year by year basis and have generated additional income for the Ranch through grazing fees. They have totaled, approximately 565 cattle at an average $18.00 per pair per month. A listing of the charge rates is available upon request. According to the Ranch Manager these leases provided cash-flow on a year-round basis and income diversification. The next owner is under no obligation to continue these agreements. It is the Manager’s opinion that the carrying capacity of the Ranch could be increased accordingly if a new owner desires. The Broken O Ranch also grazes cattle on 33 State of Montana Leases for a total of 15,270± acres which provide approximately 4,403 AUMs. A small 160-acre Bureau of Land Management (BLM) federal permit is also controlled by the Ranch. These types of grazing leases are typical of large working ranches in Montana and the entire Rocky Mountain West and are usually transferred with the deeded lands. Generally, the deeded lands control access and water and these leases have some measurable contributory value based on their AUM ratings. It has been estimated that the state and federal leases controlled by the Broken O Ranch contribute only about 0.08% to its overall carrying capacity. The farming component of the Ranch is expansive and complex. On average, the Broken O Ranch produces 25,000 tons of alfalfa hay and about 700,000 bushels of grain crops annually. Wheat yields on irrigated crop land average 70 to 75 bushels per acre. Barley crops average about 80 bushels and can go as high as 110 bushels per acre. Protein levels of the wheat crop are monitored very closely. Typically protein levels on these crops range between 14% and 14.5%, with protein levels on dryland crops typically between 15% to 16%. A dry fertilizer mix is applied in the spring when the crop is planted. The abnormally wet spring of 2011 washed much of the fertilizer out of the ground resulting in lower than normal protein levels in both the irrigated and dryland wheat crops. Historically the high-protein levels maintained in the wheat crops have commanded a premium on the commodities market. One hundred grain bins and flat storage facilities provide for over 1,000,000 bushels of grain storage on the Ranch. Thirty-eight fan systems are utilized among the 52 bins with aeration capabilities. The massive grain storage capacity of the Ranch has historically allowed the management to carefully watch grain markets and hold to sell during high demand/high value markets. This has required patience in waiting for strong grain prices. The Ranch has one substantial alfalfa hay contract in place for 2012. Approximately 500 tons of second cutting hay is shipped to Othello, Washington where it is processed and cubed for shipment to the Pacific Rim. Historically, the Ranch has also shipped hay to various dairy operations in Southern Idaho. Additional local hay sales occur annually with neighboring cattle producers. The Ranch generally sells between 7,000 to 8,000 tons of hay annually between direct sales or running it through cattle in the feedlot. Typically, about 800 to 1,000 acres of hay land is taken out of production and put into grain on an annual basis as part of the long-term farm plan. 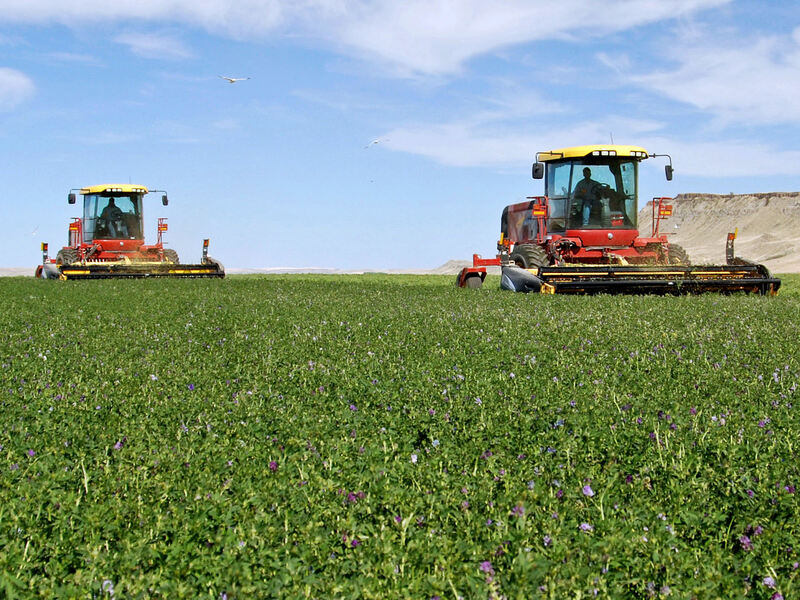 After three years of growing small grains, fields will be planted back into alfalfa production. A comprehensive 2012 Farm Plan will be available to well-qualified Prospective Buyers. The 68 center pivots on the Ranch consist of 60 Valley® systems, four Olson Pivot© systems, three older Lockwood® systems and a Wade Rain® pivot system. The Ranch has transitioned some of the older systems into the Valley® brand which has provided consistency in maintenance and simplified keeping replacement components for one type of system. The Olson Pivot© systems were installed in the early 1980s and may need replacement within the next several years. All irrigation systems and replacement parts will convey to the Buyer at the Closing of a Sale. Water is pumped to each of these pivot systems directly from surface sources such as supply ditches and streams which feed pumping stations. Five of the existing pivot systems are gravity flow. Electrical pumping costs associated with these systems were $18.62 per acre in 2010. In general, electrical pumping costs in the Western States will run between $30.00 and $100.00 per acre annually. The Ranch controls an extensive number of irrigation and stock water rights on streams, stock ponds and wells with very good priority dates. A complete list of water rights and water right claims controlled by the Ranch is available upon request through our Bozeman Office. In this document, water rights refer to post-1973 rights for stock, domestic or other uses that have been issued permits or certificates for use. 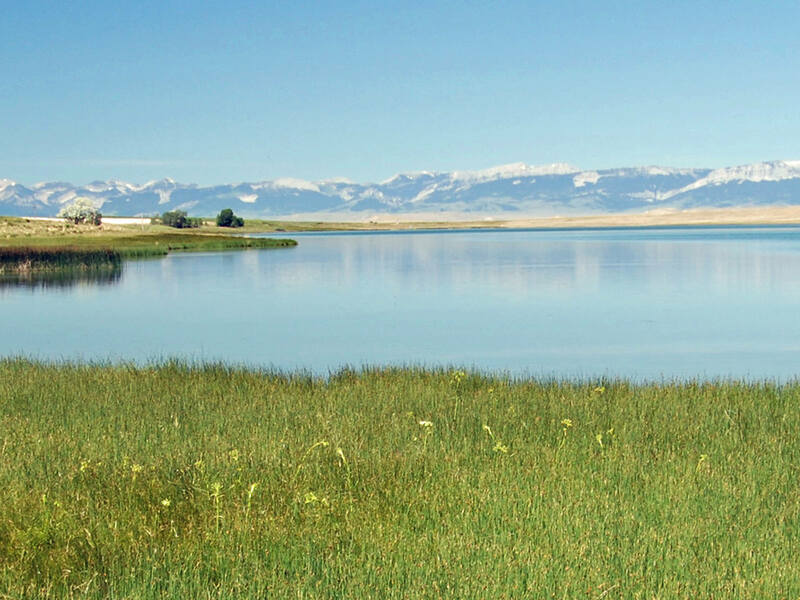 Water right claims refer to pre-1973 rights, including decreed rights made by the Ranch that have not been fully adjudicated by the Montana Water Court. • 202.36 Acre-Feet in the Fort Shaw Irrigation District. The Ranch controls approximately 44% of the stored water in the Nilan Reservoir, located west of Augusta, which is filled from Smith and Ford Creeks. When the water leaves the reservoir, it is delivered via Smith Creek which in turn flows into Elk Creek. Nilan water is diverted from Elk Creek into the Hogan-Scheerer Ditch or can be diverted, as needed, into the Bickle-Burke, Company or Lytle-Clemons Ditches. In addition stored Nilan water, the Ranch has 460 acre feet of free-flow water, which is excess water available only during spring runoff. The FlorenceCanal is a distribution canal delivering Nilan Reservoir stored water to a pivot located on the south end of the Ranch near the Mott House and Calving Facility. The Greenfields and Fort Shaw Water Projects were federally-funded Bureau of Reclamation Water Projects constructed by the Army Corp of Engineers. This expansive water project was authorized by the Secretary of the Interior in February 1906. Actual construction began on the FortShaw Division in May 1907, and wrapped up by late summer of 1908, with the first water flowing through the Canal in 1909. The Greenfields Division of this irrigation project began in 1913, with water flowing to irrigators in 1920. The FlowereeCanal is the Ranch’s primary distribution canal which carries previously decreed Sun River water to irrigated land lying north of the River. It also captures and delivers use/filed water from Cutting Shed, School Section, Elbow and Big Coulees. The Ranch controls the majority of the water in the FlowereeCanal with only one other user at the end of the canal. According to the Department of Natural Resources and Conservation, the Ranch has currently filed on 27 domestic water rights and 35 stock water rights on seasonal streams, stock ponds and wells. A complete list of the Domestic and Stock Water Rights is available upon request through our Bozeman Office. Water rights in the SunRiver Basin (Basin 41K) are currently going through re-adjudication with the Montana Water Court, and as a result of that process, some water rights may be changed as to validity, amount, priority date, place of use and other changes the Court may decide. The Seller has made all filings currently required and will transfer the water rights as they currently stand with no warranty, as is common in real estate transactions in Montana pending completion of Montana’s general stream adjudication process. All water rights and water right claims appurtenant to and for the benefit of the Ranch will be conveyed to the Buyer at closing of a sale. Two oil and gas leases are currently in place on the Ranch for the mineral acres that the Ranch owns. The existing leases pay approximately $79,000.00 annually to the Ranch. Details of these leases will be provided to well-qualified Buyers and their agents. 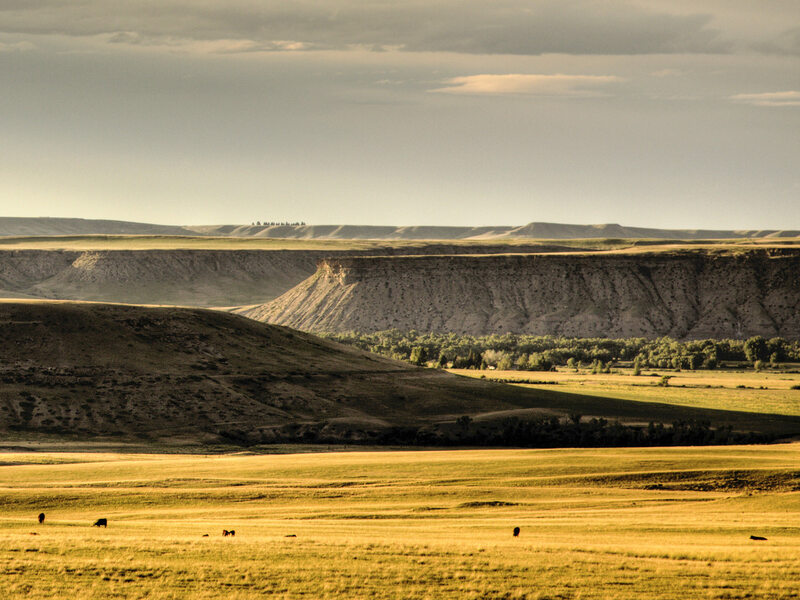 The elevation gain on the Ranch from the lowest point of the Sun River to the highest elevation is about 1,090 feet. 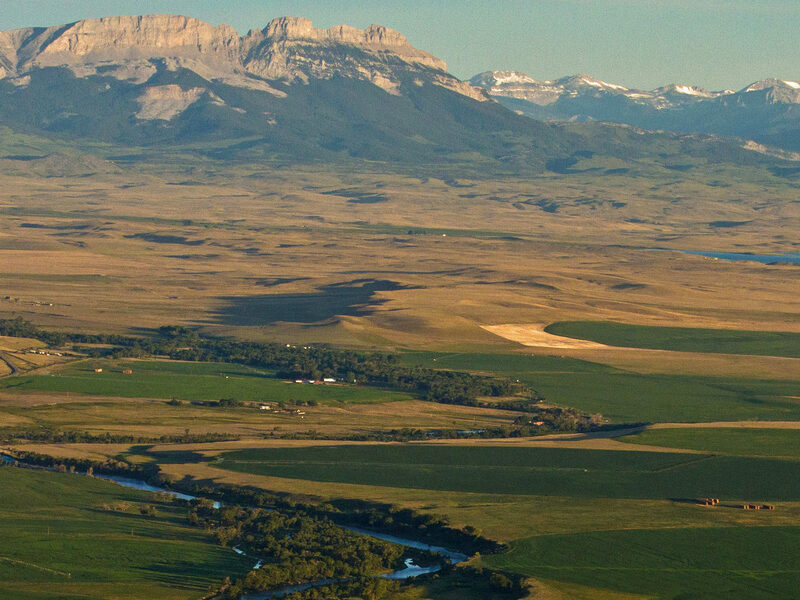 The western edge of the Ranch on the Sun River sits at 4,000 feet above sea level with the eastern edge at 3,600 feet. The peak at the southern portion of the Ranch has an elevation of 4,694 and the Owner’s Home sits at 3,800 feet. Due to the surrounding mountains, the massive acreage and the diverse terrain, along with the variations in elevation, there are many microclimates within the confines of the Ranch. The average annual precipitation is 12 to 13 inches. The average growing season of the area is approximately 129 days. The long hours of summer sunshine combined with the majority of the rainfall in May and June provide a favorable climate for dryland farming. Average high temperatures in June, July and August range from 72° to 81° Fahrenheit. In December, January and February average low temperatures are between 32° and 41°. Summer average minimum temperatures range from 45° to 51°. Winter average minimum temperatures are typically between 11° and 16°. There is plenty of sunshine throughout the year. All of the improvements on the Ranch, including interior and perimeter fencing, are well maintained. They are very functional and reflect no large future deferred maintenance expenses. The buildings at the Cattle and Farm Division appear to be very well maintained and functional. Matching full-service shop facilities are located at both the Cattle and Farm Divisions complete with concrete floors, heat, 220-volt power and large roll-up doors to accommodate large machinery. Bathrooms and break rooms are also provided at each location. Equipment storage facilities are also located at both Divisions and are adequate to serve an operation of this size and scale. Combines, tractors, semis, swathers and balers are all stored in one of these storage facilities through the winter months. A complete inventory of the facilities will be provided to well-qualified Prospective Buyers and their agents. The corral system and holding pens at the Cattle Division can comfortably handle in excess of 5,000 head of cattle. The Ranch utilizes a state-of-the-art tub and alley system connected to a hydraulic squeeze chute to efficiently process cattle. Pregnancy testing and branding takes place at several locations throughout the Ranch. The Cattle Division facility primarily processes cattle during weaning and shipping and is utilized for any of the cattle being held in the feedlot. A 60,000-pound Fairbanks-Morse® certified beam scale serves the expansive cattle facility. Two alley systems can be run in parallel which lead to two separate loading chutes – providing for efficient loading/unloading of large numbers of cattle. Each of the three calving facilities also contain corral systems to sort and process cattle. In addition to the calving facilities and the facility at the Cattle Division, five supplemental cattle handling pens are located at various locations throughout the Ranch. A modern sale barn with seating for about 300 is located at the Cattle Division. This facility was once utilized by the Ranch for the sale of livestock. Today, this facility is primarily used by several purebred breeders whose bull calves are fed in the feedlot and sold at this barn. The Feed Mill is located at the Cattle Division near the feedlot and is operated by two full-time ranch hands when running at capacity. One person operates the computer system which calculates the rations going into the feed truck. The second person runs the truck, distributing a pre-calculated feed ration and weight to each pen. Four 38,000-bushel bins feed into the Feed Mill through a series of augers and storage hoppers. Computers in the Mill calculate rations to be fed to each pen. The approximately 10,000 square-foot owner’s home is ensconced in a stunning setting on the Ranch, overlooking the Sun RiverValley up to the breathtaking Rocky Mountain Front. The home consists of five bedrooms, seven full bathrooms, a spacious office area and recreational room as well as an indoor swimming pool. The well-designed kitchen and expansive family room, which includes a wet bar, is well suited to accommodate entertaining and large family events. Just off the kitchen is a more formal dining room which enjoys commanding views of the Ranch, plus an intimate breakfast nook area for smaller gatherings. The upstairs reading room is private and overlooks the living spaces below. The home has an attached garage which comfortably accommodates three full-size vehicles. A complete inventory of the employee homes and mobile homes will be available to well-qualified Prospective Buyers and their agents. Electricity is provided by Sun River Electric Cooperative based in Fairfield. Telephone service is provided by Three Rivers Communications. Domestic water for the homes and corrals is provided by individual wells. All residences are on individual septic systems. The taxes on the real estate and improvements for 2011 were $243,051.51. 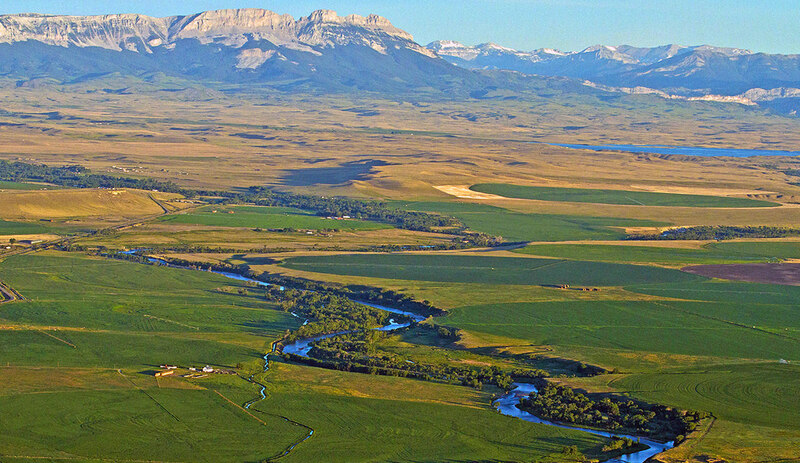 Three conservation easements with the Montana Land Reliance are in place encumbering approximately 9,701 acres along the Sun River corridor. These easements were placed over a three year period in 1995, 1997 and 1998, limiting the usage of these acres to agricultural use only. The easement contracts restrict the number of residences to be placed on the land under easement and restrict the subdivision and sale of the property to 160 to 320-acre tracts for agricultural use only. Besides the county government payrolls, the Broken O Ranch is one of largest employers in the region. With 25 full-time ranch hands and an additional four to five ranch hands during calving and irrigation season, staffing is an important part of the Ranch Manager’s duties. Dan Freeman has been the Manager of the Broken O Ranch serving the Moore Family since Bill and Desiree Moore purchased the Ranch in 1988. Dan and his wife, Tina, are desirous of retiring and spending more time with the grandkids after dedicating 25 years of their lives to the Moore Family. For the past two years, Dan has mentored a replacement to run the Ranch upon his retirement, Kyle Kelley. Kyle grew up on his family’s ranch in the DeerLodgeValley. Kyle’s expertise is on the livestock side of the operation, although he is quickly learning the farming operation. Dan would be willing to work with a new owner on a consulting basis during a transition period. It is his strong desire to serve a new owner to continue the tradition of the Broken O Ranch and see it grow and prosper. Two full-time mechanics handle the maintenance on all machinery, vehicles and heavy equipment. Their responsibilities are divided between the Farm Division and the Cattle Division/Heavy Equipment. Six to seven ranch hands from the farm crew spend the winter months strictly on maintenance of the equipment and the hauling of grain. The focus of the staff is on maximizing the production of crops and beef. The crew is divided between these two general areas in order to maintain continuity and efficiency in the season-to-season tasks. After crops are harvested and calves are weaned and shipped, the crews shift their attention to maintenance and repairs on calving facilities, fencing and livestock water in preparation for the colder winter months. In addition, the Ranch employs a full-time bookkeeper who also oversees the maintenance and upkeep of the Owner’s Home. She would be willing to work with the new owner of the Ranch to transition ownership and bookkeeping. Like many other young adventuresome entrepreneurs in the 1800s, Daniel Flowerree left his home in Missouri in 1852 to find his fame and fortune in the gold fields of Montana. After several years of hard luck, he found his fortune in the mining claims around Helena. Young Flowerree soon realized the abundant possibilities in the cattle industry in Montana with its vast grassy prairies and plentiful water resources. Flowerree trailed 65 head of mother cows from his home state to the grasslands of Montana. On his way through MilesCity, he acquired a business partner by the name of Lowry. These two stockmen worked their way west to the Sun RiverValley. It was in the early 1870s that these cattlemen purchased 1,500 head from Texas and they made their way north along the renowned Chisholm Trail. Several years later another large herd was purchased from the OregonTerritory and trailed across the Rocky Mountains to the Sun RiverValley. The Flowerree and Lowry Cattle Company was created and the town of Lowry was established on the Ranch (on the eastern edge of the current day Broken O Ranch). The two cattle barons also bought and raised a large remuda of horses which they utilized on the Ranch and traded with other cattlemen and locals. When the Flowerree and Lowry Cattle Company was in its prime in the early 1880s, local historians claim that these cowmen were running between 25,000 and 40,000 head of cattle from Wolf Creek to the Canadian border! Through the financial trials and tribulations of the devastating winters when the majority of the cattle herd were lost, Daniel Flowerree’s son, William K. Flowerree, became a great asset to his father. With the aging of his father, William began taking over many of the ranching responsibilities. The open range was diminishing with settlers moving from the east, and the Flowerrees realized that in order to operate the size of herd they needed, land would need to be purchased. The Flowerree Ranch – A Stockman’s Paradise, Jon K. Hane – Page 44. The passing of the Reclamation Act by the federal government in 1900 allowed anyone to claim land which they were able to irrigate and take out of prairie. With the plentiful supply of water from the Sun River flowing through the Ranch, young William saw this as a superb opportunity to acquire additional lands to run cattle, but more importantly, land to grow hay crops in order to avoid the devastating losses of the 1881 and 1886 winters. William was soon put in charge of building a canal to irrigate the vast prairie lands north of the Sun River. With slips and over 150 men, it took three years to complete the main ditch. The Flowerree Ranch – A Stockman’s Paradise, Jon K. Hane – Page 45. The Ranch flourished for nearly 45 years before it eventually fell on hard times and was sold at a sheriff’s sale on the courthouse steps to the Teton Land Company. With new management the Ranch once again became the largest cattle ranch in TetonCounty. The Texas longhorns brought to Montana by Flowerree were replaced with English Hereford cattle which were better acclimated to the climate of the Rocky Mountain Front. The Flowerree Ranch – A Stockman’s Paradise, Jon K. Hane – Page 49. In 1944, Teton Land Company was sold to John Hamilton. Under Hamilton, several ranch buildings were updated and bathrooms were installed in many of the bunkhouses. Additional crop lands were established and irrigated increasing the production of the Ranch. William and Desiree Moore, founders of the Kelly-Moore™ Paint Company, first came to the Sun RiverValley in 1988 and purchased the Hamilton Ranch and, soon thereafter, the Freeman Ranch – constituting the core of the Broken O Ranch. Over the course of the next 20 years, the Moores continued to purchase and block land resulting in the present-day configuration. The Moores quickly realized their need for a competent and trustworthy individual to not only manage his assets, but one who was well respected in the community. With the acquisition of the Freeman Ranch, they found Dan Freeman. Freeman’s family had operated a commercial cattle operation along the Sun River since 1948. Dan Freeman has been an integral part of the Moore Family and development of the Broken O. The Ranch and lifestyle that Montana offered quickly became William Moore’s passion. He would spend weeks on end there entertaining friends and riding with his close friend, Dan Freeman. Freeman recalls spending many days riding in his pickup with Moore, answering questions ranging from irrigation head gates and barley crops to their breeding program for the upcoming year. William Moore was a hands-on owner who wanted to be knowledgeable about not only the operation of the Ranch, but the lifestyle that surrounded it. He spent countless hours reading and studying to increase his knowledge base in agricultural production. Freeman comments that Bill “…was still jumping ditches at 70 years of age.” A life-long innovator, he constantly challenged Freeman and his crew to find better and more efficient ways of operation and was always the first to provide the necessary tools for success. William Moore was a very unassuming man and took tremendous pride in his cattle and the stewardship of the land and its resources. With all the changes throughout the history of the Sun River Valley, the integrity, productivity and attraction to the area have remained unchanged for those pioneering spirits similar to young Daniel Flowerree. 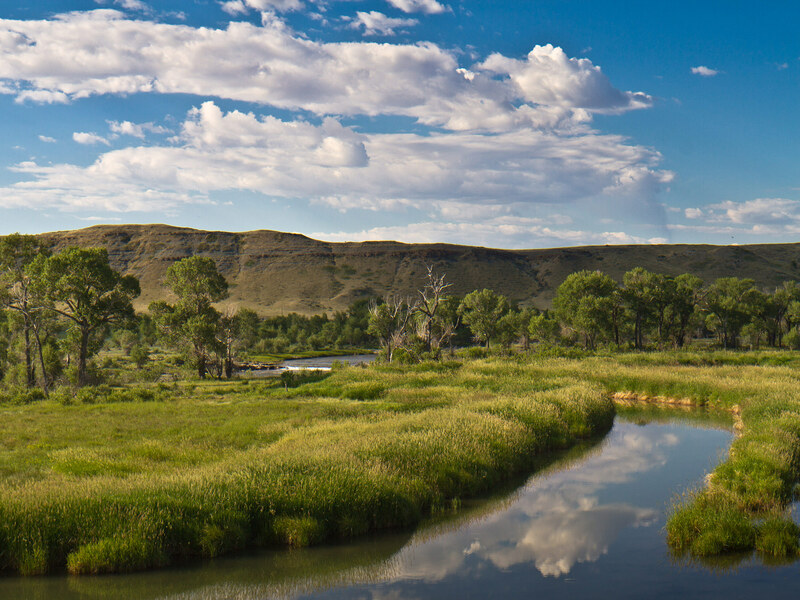 Controlling approximately 20 miles on both sides of the Sun River creates a virtual private fishing reserve within the confines of the Ranch. Continuous pool and riffle fishing make it difficult for drift boats to put in upstream of the Ranch and float this stretch in a day, other than during high water. Sporty browns and rainbow trout thrive in the deep pools and feed in the riffles, generating good numbers of large fish. The Sun River originates in the renowned Bob Marshall Wilderness and flows for a little over five miles before reaching the Gibson Reservoir. The Gibson Dam regulates the River, providing consistent flows through most of the summer months. The Gibson Reservoir and DiversionLake are located northwest of the Ranch on the Sun River. These reservoirs contain rainbow and brook trout and Arctic grayling. Pishkun and Willow Creek Reservoirs, also in the Sun River drainage, offer the angler opportunities to catch “trophy” trout and pike, as well as Kokanee salmon. After coursing through the Ranch, the Sun River continues southeast where it joins the Missouri River at Great Falls. LowryLake is a spring-fed private lake located just north of the Cattle Division on the Ranch. The Lake is approximately one mile long and is stocked with Kamloops trout. The Lake and the Sun River provide outstanding waterfowl hunting with the location of the Ranch situated along the western edge of the Central Flyway. Along the River corridor are extensive spring-fed wetlands combined with a plethora of small streams that feed into the Sun River creating a prime habitat for waterfowl, upland game birds and other wildlife. In the heat of July and August, LowryLake is also a great location for jet skiing or boating. Significant populations of Hungarian partridge, pheasant and sharp-tailed grouse are observed throughout the Ranch. The irrigated grain fields through the core of the Ranch provide a readily accessible food source. The lush riparian habitat along the River and other tributary streams combined with the grain crops and cover greatly enhances the quality and numbers of wildlife which is apparent through the abundant numbers of whitetail, mule deer and antelope scattered throughout. For the employees of the Ranch there is an incentive program offered for a buck drawing. The Ranch allows for seven buck permits to be drawn annually. Any employee, with proper hunting tags, who has been working for the Ranch ten or more years, is automatically allowed to hunt each year; all other employees wishing to hunt for bucks are handled by the drawing process through the Ranch. Employees can also hunt whitetail and mule deer does on the Ranch during season. Public hunting has been allowed through permission only. Typically, two to three hunters per day are allowed on certain portions of the Ranch to hunt whitetail and mule deer does. The Ranch is located in hunting District 444. For specific regulations and additional information please refer to the Montana Fish, Wildlife and Parks website at www.fwp.mt.gov. A waterfowl hunting and fishing lease is currently in place with a personal friend of William E. Moore. The lease is limited to waterfowl hunting and fishing the stocked ponds and the River. The lease includes using one of the ranch houses, and the total annual income from the lease is $10,200.00. The outdoor amenities of North Central Montana are abundant, fulfilling the prerequisites of any recreation enthusiast. The Bob Marshall Wilderness Complex situated just west of the Ranch is comprised of about 1,535,352 acres. “The Bob” is the fifth largest wilderness area in the United States. Its sustained beauty is due in part to the Wilderness Act of 1964 which prevents any roads or structures from being created, as well as no motorized or mechanical equipment allowed in the area. The Wilderness is accessible by foot or on horseback through its abundant trail system. Hunting, fishing and camping are all allowed with the proper permitting. Wildlife within the area includes grizzly and black bears, moose, elk, mountain goat, bighorn sheep, wolverine, wildcats and lynx. To the northeast of the Ranch, near the town of Fairfield, lies Freezeout Lake. While this Wildlife Management Area offers hunting, wildlife viewing, and the opportunity to iceboat in the winter, it is also the primary staging area for snow geese in their spring migration from the Gulf States. In early March as many as 300,000 snow geese and 10,000 tundra swans gather at the Lake to rest before continuing to the extreme northwest Arctic Coast of Canada. Fairfield also offers golfing at the Harvest Hills Golf Course with a beautiful backdrop of the Rocky Mountain Front. Golfing is available at the Choteau Country Club, as well as a new course at the Eagle Falls Golf Club in Great Falls. For many decades, travelers have journeyed down the Missouri to see the inspirational rock formations and limestone cliffs. Scenic boat tours are available to enjoy the beauty that has not changed since the days of Lewis and Clark. To gain additional knowledge of the “Corps of Discovery” Expedition and the history of the area, it is well worth visiting the Lewis and ClarkInterpretiveCenter in Great Falls which offers lecture series, films and exhibits. Rarely do we see authentic legacy ranches encompassing over 100,000 acres of deeded land come on the Western real estate market. The history and grandeur of the Broken O Ranch remain pale unless personally witnessed. The magnificence goes beyond the breathtaking views of the Rocky Mountain Front and the beautiful Sun River corridor meandering through the heart of the Ranch. The western skyline before us was filled high with a steel-blue army of mountains, drawn in battalions of peaks and reefs and gorges and crags as far along the entire rim of the earth as could be seen. Summit after summit bladed up thousands of feet as if charging into the air to strike first at storm and lightning, valleys and clefts chasmed wide as if split and hollowed by thunderblast upon thunderblast. Ivan Doig, “This House of Sky”- Page 180. The Broken O Ranch reflects Bill Moore’s commitment to the land and his passion for the cattle industry. An icon of American ingenuity, hard work and excellence, Moore transcended his profession and applied that same level of commitment to his love of the land and the Western way of life. This commitment is evident in the stewardship and attention to detail manifested in so many aspects of the Ranch and its operation. Great skill and care has been applied to every facet of the operation, from the selection of the breeding stock to the exquisitely managed grass resource to the maintenance of the infrastructure. The integrity of this ranching tour de force exudes an aura of unique greatness. 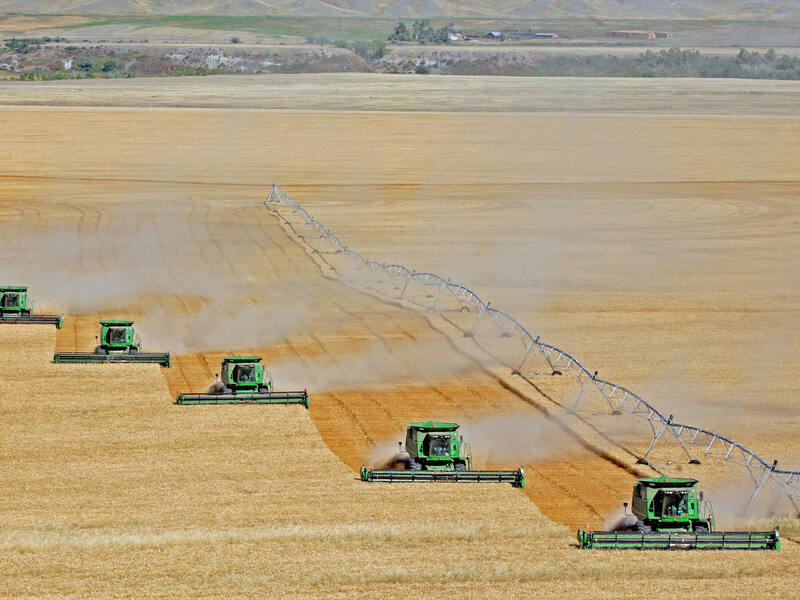 This storied operation holds a singular position by containing the largest irrigated acreage in the State of Montana. The Broken O sits on a pedestal as one of the iconic ranches of the West. Other large operations exist in the Rocky Mountain West, but few rival the production, beauty and scale offered by the Broken O Ranch. The successor to the Broken O will inherit a ranching history like no other in Montana. The Flowerree Ranch – A Stockman’s Paradise, Jon K. Hane – Page 50. The remarkable condition of the range land is the product of William and Desiree Moore’s 25 years of careful stewardship and direction. The Broken O Ranch is one of the most significant holdings in the Rocky Mountain West to become available in decades. The scale, commodity production, recreational amenities and overall diversity make the Ranch one of the most unique offerings we may ever see. The next owner of the Broken O Ranch will take an immediate high rank among the Nation’s elite in the beef and agricultural industries.